This was originally going to be a few quick thoughts on Facebook, but apparently that’s impossible for me. So, here are a four quickish thoughts on America, the 4th, patriotism, and so forth. 1. I love America. It’s my home and I know I’m blessed to live here for a number of reasons whether historical, political, economic, and so forth. The freedoms granted and the high ideals (however poorly executed at times) bound up with the American idea stirs the heart. I’ll admit, I pledge to the flag and still stand when I hear the national anthem. I don’t think loving Jesus, confessing him as Lord of all creation, means I have to hate or disavow my country, or refuse to celebrate it in any way, shape, or form. In fact, to refuse to do so entirely may be a form of gross ingratitude towards God. Nor do I think it rules out being a good citizen, praying for my nation, voting, and so forth. In fact, it probably requires those things as part of my duty to love my neighbor through promoting the common good. 2. America is a gift from God, not God. Think that through. God is eternal, self-existent, holy, loving, righteous, pure, omnipotent, gracious and my sole hope, strength, savior, final end, and source of all good. America is not. It is a finite, created thing and needs to be evaluated as such. It is a “power” that participates both in the common grace blessings of God as well as the fallenness common to both human and non-human reality this side of the 2nd Coming. Those who can’t see the good, glory, and blessing in America’s history and structure have an overly pronounced Nietzschian squint. Those who can’t see the sin, the shame, and darkness in it probably need to take off their Red, White, and Blue colored glasses. 3. 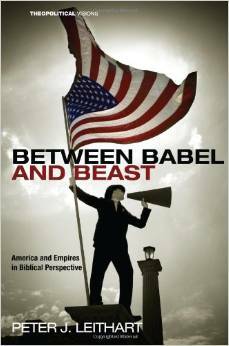 America is not “God’s New Israel”, nor is it in any sense analogous to the Church. Without delving too deeply in on the subject, I’ll just say that the only options for orthodox Christians looking to be faithful to God’s word is to see Israel as Israel, or, as I hold, the transnational, universal Church as the Jew + Gentile reality of the new Israel brought together in the body of the Messiah, the True Israel. I’m sorry, but the US figures nowhere in biblical eschatology. Any attempt to paint America’s redemptive-historical place in world history as anything more positive than a modern-day Persian Empire (think Cyrus), used like any other nation in God’s providential ordering of history, is false to the Bible and possibly an ecclesiological heresy Peter Leithart has termed “Americanism.” If this is something you’re tempted towards–especially on American Holy Days where we celebrate our creation myths, laud our national saints, and participate in American liturgical ceremonies–I’d recommend you pick up his book Between Babel and Beast and get to repenting, right quickish. While I don’t follow Leithart everywhere he goes, it’s edifying and eye-opening read. Do your parishioners know the theological difference between the Kingdom and the Nation, and the proper ordering of their loyalties? Would Christians of other nations feel utterly bewildered and unwelcome in your service? Would people be tempted to conclude that God’s election of America as a nation is the greatest saving event in history, or the life, death, and resurrection of the Son is? What, then, is the end of the matter? Go ahead and have fun tomorrow. Be grateful. Light off fireworks. Eat good food. But in the middle of the BBQs, parades, and fanfare, remember that God is God, Christ is Lord, and America is a finite, temporal gift to be grateful for, but never worshipped or set apart in the heart as a final end in itself. You could replace “quick” with “dead on”! There’s so much polarization with how churches celebrate patriotic days. It doesn’t have to be full blown or nothing at all. Our worship should exalt Christ- go figure! Thank you for this post! Amen to all 4 points made. Well put, brother. “Amen” from a Canadian believer.